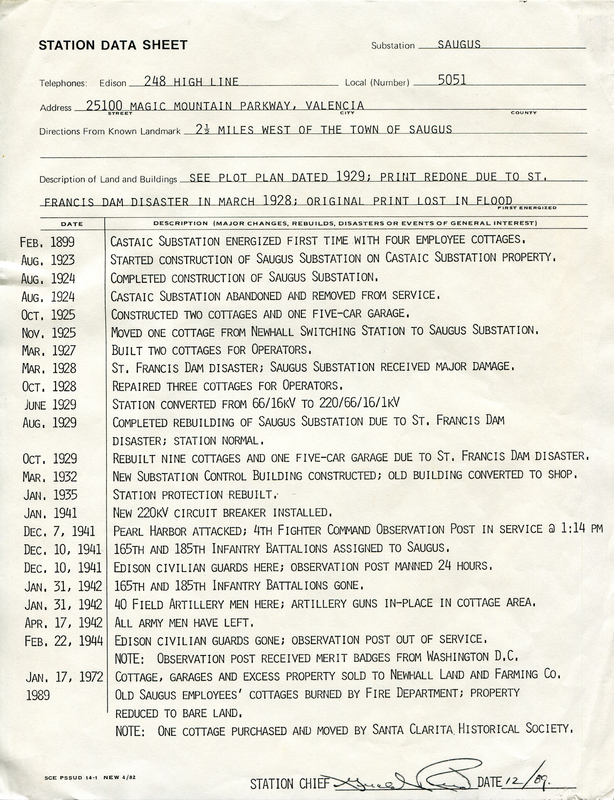 SCVHistory.com | Saugus | Edison Substation Data Sheet (Re: Edison House at Heritage Junction). This SCE document is the service record of the Saugus Substation at the location indicated on Magic Mountain Parkway, commonly known as Edison Curve. 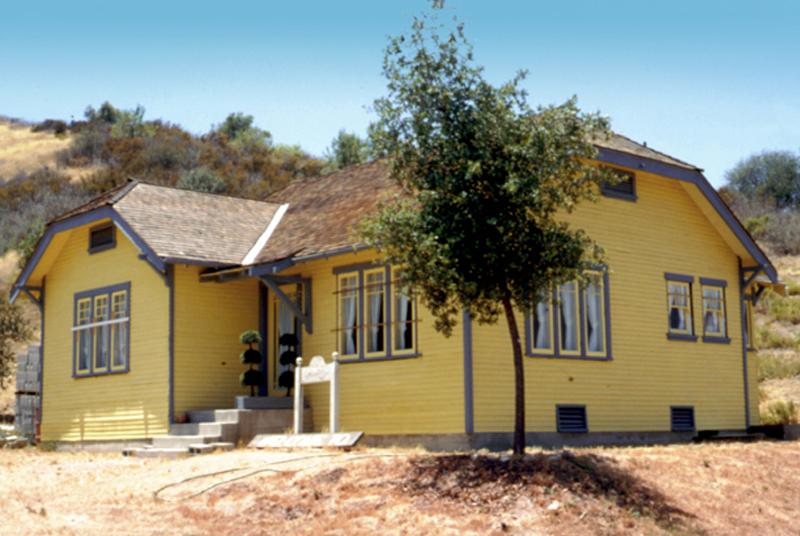 The record is associated with the Edison House, the only remaining cottage (of nine) built for substation employees. As indicated, the cottages were damaged and/or destroyed in the 1928 St. Francis Dam disaster and rebuilt in 1929. They were eventually decommissioned and sold to Newhall Land; in 1989 they were burned down in an L.A. County Fire Department training exercise. One was rescued and moved to the SCV Historical Society's Heritage Junction Historic Park in Newhall's William S. Hart Park, where it was restored by the Oak of the Golden Dream Questers and other volunteers. Of particular note in this service record is the protection provided to the substation by the U.S. military immediately following the December 1941 attack on Pearl Harbor, which precipitated America's entry into World War II. Description of Land and Buildings: See plot plan dated 1929; print redone due to St. Francis Dam Disaster in March 1928; original print lost in flood. Feb. 1899 Castaic Substation energized first time with four employee cottages. Aug. 1923 Started Construction of Saugus Substation on Castaic Substation property. Aug. 1924 Completed construction of Saugus Substation. Aug. 1924 Castaic Substation abandoned and removed from service. Oct. 1925 Constructed two cottages and one five-car garage. Nov. 1925 Moved one cottage from Newhall Switching Station to Saugus Substation. Mar. 1927 Built two cottages for Operators. Mar. 1928 St. Francis Dam disaster; Saugus Substation received major damage. Oct. 1928 Repaired three cottages for Operators. Aug. 1929 Completed rebuilding of Saugus Substation due to St. Francis Dam disaster; station normal. Oct. 1929 Rebuilt nine cottages and one five-car garage due to St. Francis Dam disaster. Mar. 1932 New Substation Control Building constructed; old building converted to shop. Jan. 1935 Station protection rebuilt. Jan. 1941 New 220kV circuit breaker installed. Dec. 7, 1941 Pearl Harbor attacked; 4th Fighter Command Observation Post in service @1:14PM. Dec. 10, 1941 165th and 185th Infantry Battalions assigned to Saugus. Dec. 10, 1941 Edison civilian guards here; observation post manned 24 hours. Jan. 31, 1942 165th and 185th Infantry Battalions gone. Jan. 31, 1942 40 Field Artillery men here; artillery guns in place in cottage area. Apr. 17, 1942 All army men have left. Feb. 22, 1944 Edison civilian guards gone; observation post out of service. NOTE: Observation post received merit badges from Washington, D.C.
Jan. 17, 1972 Cottages, garages and excess property sold to Newhall Land and Farming Co.
1989 Old Saugus employees' cottages burned by Fire Department; property reduced to bare land. NOTE: One cottage purchased and moved by Santa Clarita Historical Society. Station Chief /s/ Date 12/89.